Sheep are reasonably intelligent, despite caricatures to the contrary. Like most animals, their behavior has been shaped by centuries of interaction with friend and foe alike. Sheep will approach and follow a particular friend, and if you can get one sheep to follow you, they’ll all come along. Homemade sheep treats offer a quick way for you to become a friend. But use them sparingly to avoid causing sheep health problems. Using favorite fresh, natural food as is one approach for making your own sheep treats. Many sheep love apple slices or bits of carrots as treats, but that’s not automatic. Like toddler children, gradually introduce sheep to new foods to develop appreciation. A time-honored technique is to mix pieces of apples and carrots into their oats, already a treat. Various unbaked treat recipes intended for horses are suitable for sheep, such as Happy Oats N’ Trail Mix Balls, a recipe shared by the Moniteau Saddle Club that combines carrots, grain, rolled oats and molasses. Sheep are grazers rather than browsers, which means green grasses and grains make up the natural sheep diet. Sheep are fed hay (dried grasses) when pasture is unavailable, so crunchy hay cubes made from alfalfa hay, one of the sweetest pasture forages, are naturals for treats. Crumble these--or similar feed cubes including grain, intended for horses--for another easy sheep treat. Again, mix hay crunchies with grain to introduce them. More elaborate homemade sheep treats are inexpensive and easy to make, and when you bake them yourself you’ll know you’ve used the best available ingredients. One possibility is the simple Sheep Treats recipe offered by the website Curious Sheep, which you can modify by adding apples, carrots or raisins. Find many similar treat recipes on the Moniteau Saddle Club website, opting for those containing grain, carrots and apples and going easy on the molasses and sugar. Don’t kill your sheep with kindness. Use treats sparingly. Sheep are ruminants, cud-chewing animals, with complex digestive systems designed for the long, steady digestion of large volumes of relatively low-nutrient vegetation. Overfeeding sheep with too much rich vegetation or high-nutrient treats can cause great digestive distress or even death. Enterotoxemia or overeating disease is caused by the release of toxins from bacteria that are natural in sheep’s digestive systems--bacteria that go into overdrive. 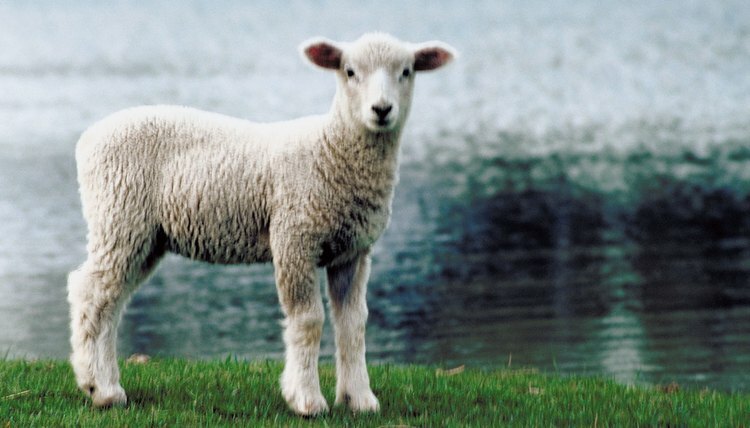 Lambs are most susceptible, but older sheep too can be poisoned and die within hours. Suddenly changing sheep feed, feeding irregularly, feeding too much grain and feeding too many “hot” or high-energy foods can cause enterotoxemia, as can internal parasites. No matter how delicious the treats, you won’t have much success taming or training sheep unless they perceive you as a friend. From the sheep point of view, as with other animals stalked by predators, “friends” are other sheep, because individual safety depends on group safety. Sheep stay close to friends, and keep enemies at a distance. Treats can help you befriend your sheep, by allowing you to gradually close the distance between you. But sheep will run from anything that frightens them, so avoid making loud noises or otherwise frightening them.